The human voice is undoubtedly one of the most intimate and direct forms of musical expression there is. It’s all about the breath. Linked to this life-force and drawn from deep within, a voice gains power from the in-breath and rides out on the out-breath, direct from one person to another. Brass and woodwind instruments also come alive on the breath, but add sculptured tubing, metal tuning keys, mouthpieces, and other add-ons and apparatus to augment the sound. An altogether more unassuming breath-dependent instrument is the harmonica, aka mouth harp, harp or mouth organ. Often the smallest handful, this top-pocket musical tool operates in a much closer relationship with the intimacy of breath than grander, blown instruments such as the French horn, bassoon or cor anglais. 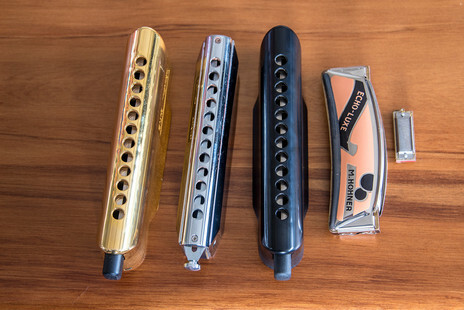 Apart from the eccentric jaw harp (and the somewhat fraught twanging of its steel sound bar against teeth and lips) there are few instruments held in such tender embrace by the player as the harmonica. With it held tight against the lips, a player blows into and draws air back from openings in the face-plate, activating fine metal reeds inside the small instrument that vibrate and confirm to the shape of the scale and tune being coaxed from it. Staccato exhalations can stab out a percussive musical blast; a strong, controlled inhalation can muster a soulful, bluesy plea, and a delicate glissando can ply the tenderest of tunes. Diatonic or fixed-key harmonicas, arranged on the seven-note major scale, are humble but surprisingly versatile. Good for straightforward tunes and perfect for wailing sounds that can emulate the human voice, the diatonic is standard kit for blues players, who pack harps in several keys to fit various songs tunings. A chromatic harmonica is a different beast. This has a shifting bar which, when activated by pushing a connector button on the side, can change the whole tuning by a semitone, so that all 12 notes in a Western scale are playable. With access to semitones and therefore the flats or sharps in a scale, the chromatic harmonica suits more complex melodic lines, and a player can draw out many rhythmic and lyrical variations by using this bar. The portability of the harmonica and the tiny packing space it requires has spread its favour worldwide. It’s been taken to sea and frequently to war. It does service on cattle musters and camping trips, at music festivals, band gigs and parties, and comes in handy for someone in a melancholy mood playing down the setting sun. And, maybe best of all, its notes are there for the taking, so even an industrious beginner can achieve a little musical satisfaction.